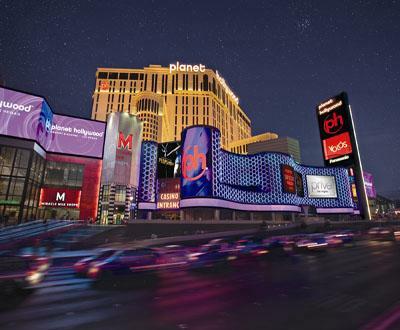 Planet Hollywood Resort & Casino in Las Vegas houses nearly three acres of gaming action, including all your favorite slots, table games and The Playing Field Race and Sports Book The Pleasure Pit is truly a thrilling Las Vegas casino experience not found anywhere else on the Las Vegas Strip. You'll play blackjack and roulette dealt by beautiful women in chic lingerie while go-go dancers move to hot beats. The slots at Planet Hollywood Las Vegas can change your life with a single bet! With a wide variety of games and denominations, including penny slots, video reels, video poker and other fun and popular variations, the Planet Hollywood casino in Las Vegas provides all the excitement a machine player could want. There's nothing like strolling up to a craps table with your entourage and trying your luck with the roll of the dice. If exhilarating table games are what you're looking for, this Las Vegas Casino has them all. With blackjack, roulette and craps, you're bound to find the action you desire! Visit The Playing Field at the Planet Hollywood Resort & Casino in Las Vegas to place your bets on your favorite team, athlete or horse. The Playing Field is a hip, high-tech hangout with 33 plasma TVs, a VIP race area and a full bar specializing in draft beer by the yard. Our beautiful poker room is home to 12 tables where you will always find high hand jackpots.